Timeless polka dots and stripes are paired with fresh lattice and geometric circles bringing a wonderfully stylized statement to the nursery in Trend Lab?s Lauren 3-Piece Crib Bedding collection. Sage green is combined with shades of a beautiful opal gray and crisp white offering endless decorating possibilities for you and your little one. · 35? x 45? reversible quilt features quilted patches of printed polka dots, stripes, lattice and geometric circles in the wonderful color palette featuring sage green and shades of opal gray with white. Backside of quilt features the sage green and white circular lattice print. · Fitted crib sheet is soft 100% cotton and features an adorable sage green and white polka dot print. Crib sheet fits a standard 52 in x 28 in crib mattress and features 8 inch deep pockets with elastic surrounding the entire opening to ensure a more secure fit. 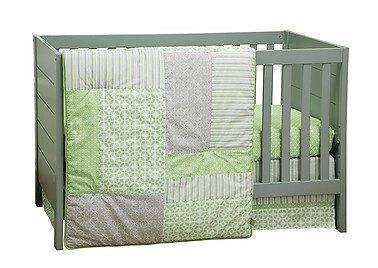 · Box pleat crib skirt with 15 inch drop features a variegated stripe print in sage green, white, and shades of opal gray, bordered by the sage green and white polka dot and circular lattice prints.